A garden hose is an essential part of the garden, but it can also be an unsightly clutter by itself when left lying on the ground. At worst cases, you might have even tripped over it. If you’re tired of this tangled mess and all set to keep your garden as organized and presentable as it can be, you’re in luck because we’ve collected a list of practical and efficient storage options for your garden hose. 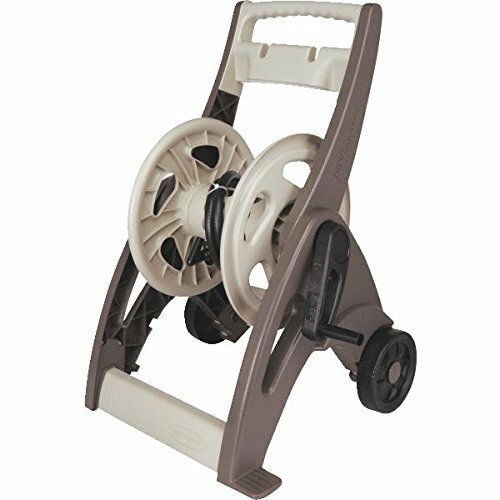 A reel cart is a wonderful way to not only keep your hose contained in your yard so that it is not piled on the ground but also to ensure that you can take it with you wherever you need to connect it to your water. When you buy a reel cart, it is important to make sure that the wheels are high-quality and in good condition so that you will not have to worry about whether not you will be able to smoothly drag and maneuver your reel cart. One problem that some homeowners have when choosing this type of garden hose storage is that it can be difficult to roll the hose up using the attached handle but there are some features that reel carts have to make this task a little easier. If you are worried about whether not you are strong enough to be able to roll up your hose quickly and easily, then make sure you buy a reel cart that has a hose guide. Another great feature to look for is an automatic return that will allow you to quickly and easily roll off your hose without having to exert yourself in order to do so. Not only does a reel cart keep your hose stored neatly so that it does not become an eyesore at your home but it also ensures that your hose does not knot or tangle. Unlike other types of garden hose storage where the hose is piled in a container, a reel cart ensures that the hose loops neatly around the center of the cart to keep it from kinking and knotting. Depending on how much room you have around the base of your home for external storage for a garden hose and whether not you can easily attach a wall-mounted storage option to your home, being able to store your hose looped up and on the exterior of your home is a great way to keep it close at hand and ensure that it is off of the ground to prevent a mess. One of the main benefits of a wall-mounted hose holder is that it takes up significantly less room than a reel cart, which is beneficial if you are worried about having ample space around your property. Additionally, wall-mounted holders come in a number of different styles and can be incredibly decorative so that you can choose a holder that will improve the appearance of your home and express your personality. Unlike most other options for storage, this type of hose storage is generally made of a durable metal, which means not only that it will be able to stand up to wild weather and years of abuse without being damaged but also that it will look higher quality and more expensive. A hideaway reel is a wonderful way to store your hose in plain sight without it becoming an eyesore. While most homeowners have hoses and are aware that their neighbors have them as well, nobody wants to see a pile of hose along the exterior of the home. Most hideaway reels for hose storage are available in neutral colors that will look great in any home but it is important to make sure that you choose colors that will be able to blend in with your property if you don’t want your hose storage to be incredibly obvious to visitors. One reason why people opt for hideaway reel storage is that the container is fully enclosed, which prevents the hose from sitting in the hot sun all day or from being exposed to the elements. While hoses are generally fairly durable, exposure to UV rays all day every day or extreme temperature swings can cause your hose to break down prematurely. Additionally, you will not have to worry about picking leaves, twigs, and other bits of debris out from the coils of your home when you opt to store it in a hideaway reel. While not nearly as common as other types of hose storage, a freestanding holder can add a touch of class to your yard depending on where you position it and what style of holder you choose to buy. These types of hose storage work by being pressed firmly into the ground with the top storage piece extended to waist height. Once you have finished using your hose and are ready to put away, it is a simple matter of looping the hose over the freestanding holder and allowing it to hang. When opting for this type of storage, there are few things that you have to take into consideration so you can rest easy that your storage will last for a long period of time and will add to the beauty of your property instead of detracting from it. One thing to consider is the location of where you were to put your freestanding holder as you need to make sure that the ground is solid and firm enough to support the heavy weight of the hose. Additionally, consider the style of the freestanding holder as they come in many different varieties and while some are quite plain, there are freestanding holders that are more ornate and attractive. A hose pot or a hose bowl is a wonderful way to store your hose near your spigot so that it can be easily accessed without it becoming kinked or dirty. One thing to consider when choosing a hose pot for your garden hose is how large the pot is as they are generally sized to be able to fit various links of hoses. For example, if you choose a hose pot that can only fit a 50-foot hose but your garden hose is 100 feet, then you will find that you are unable to get your entire length of hose into the pot. It’s important to consider buying a hose pot that has drainage holes in the bottom so rainwater does not collect in the pot. While the water will not damage your hose, it can become a breeding ground for mosquitoes. Because many people do not think about dumping the pot on a regular basis, this is likely to become a major problem at your property. Because hose pots come in so many different styles and designs, it is usually easy to find one that you find aesthetically pleasing but will still be as functional as other hose pots. One of the most common solutions that people have discovered for hose storage is a wall-mounted hose reel. This is a very convenient way to get your hose back where it needs to go after you use it. It features an incredibly simple design with a turn handle that will pull the hose back towards the reel. Once it has been pulled back in, you will simply wind it up and store it beside the reel. If you want to purchase something that isn’t going to take up a lot of space, then this is a good option. You can find hose reels that are much larger than the one being shown off here, but this particular one is interesting because of how small it is. You can fit this one onto an outside wall that will allow you to attach it. Once it is installed, reeling in your hose will always be exceedingly simple. One problem that people have with this garden hose storage solution is that it doesn’t look as tidy as they might like. If you are very particular about the way everything looks, then this option might not be as good for you. The reel is very simple to use, but the hose may not look incredibly orderly being wound up and stored beside it. There are other options on the market that will do a better job of making things look neater. In spite of this, this hose reel is very inexpensive, and it does the job well. If you want something that will be easy to install and even easier to make use of, then this is a great product to consider. It will work well to reel in your hose and will make storing it beside it a simple task. Just look into other options on this list if you want to conceal the hose, as there are plenty of products to consider. If you want to hide your hose away when it isn’t in use, then buying a copper pot hose holder is going to work out very nicely. This is going to allow you to tuck your hose away inside of something that looks very decorative. A copper pot is going to look really nice in your garden area or on your patio. Most people won’t even realize that you’re using it to hide a hose because it looks so decorative. These copper pots are specifically made for the purpose of holding hoses. They have holes in them so that you can drain out water from the hose, if need be. They can fit up to 100-foot long water hoses, too, so you won’t have to worry about size being an issue. This is a great solution for people who think that water hoses aren’t aesthetically pleasing. Buying one of these copper pots will be somewhat expensive in comparison to some of the other options on this list. There are more cost-effective garden hose storage options available to you. However, this is definitely one of the best looking options that you can consider. 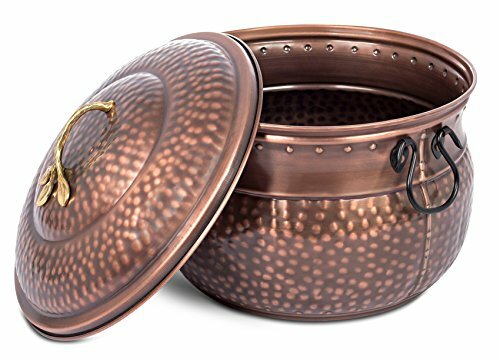 If you want to buy something to store your garden hose in that looks fantastic, then you can’t go wrong with a copper pot. It should also be mentioned that people sometimes use these pots for purposes other than storing garden hoses. They’re very pretty, so using them to house other items certainly isn’t out of the question. Although they’re crafted with the purpose of storing water hoses, you could use this indoors to store other items if you want to. So, if you want to repurpose this copper pot during the winter months, then that is an option available to you. This is another structure that is meant to house your garden hose. You can hook it up to the water and easily make use of it whenever you need to use your hose. This particular hidden hose reel has a few advantages that make it unique, though. 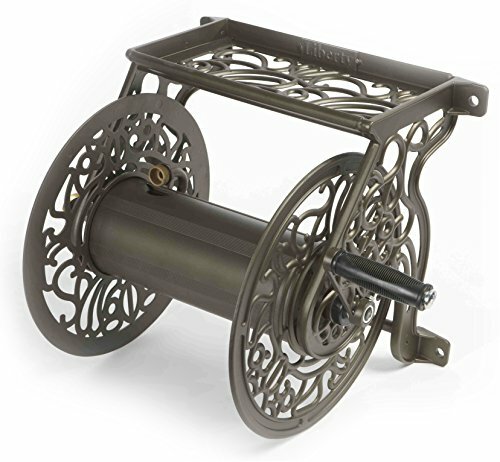 The first thing that you will notice about this hose reel structure is that it has a really nice wicker design. If you’re a fan of wicker, then this might be the best option for hose storage to fit in with your style. If you already have wicker patio furniture, then this is going to look like it belongs in your yard. The style is very important, and this hidden hose reel is definitely appealing in that way. This hidden hose reel is also capable of winding in your hose very easily. It is designed using a smart system that helps the hose to wind in properly. This is going to guide the hose so that everything is stored as neatly as possible inside of the structure. Being able to have this assistance means that you won’t have the fumble around with the hose and worry about it getting kinks. 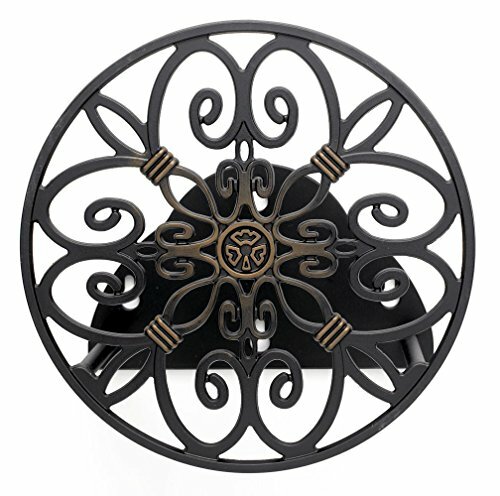 You will be able to set this hidden hose reel up in your yard or on your patio very easily. It is a simple standing unit much like the hideaway hose above. If you are the type of person who doesn’t want to have to mess around with installing anything, then this is going to be a great item for you to purchase. You’ll love the way it looks, and it will work well for you right away. 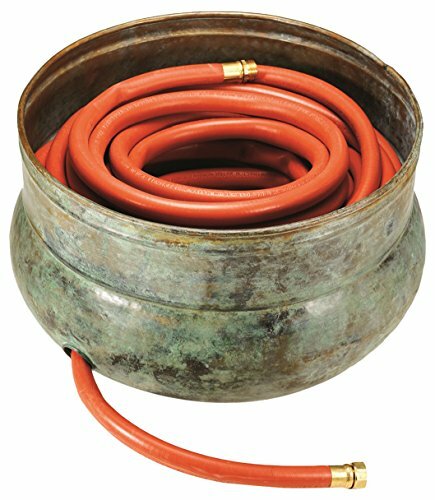 The idea behind the terracotta hose container is basically the same as the copper pot. If you love the look of terracotta containers and other such items, then this is going to appeal to you. People who make use of other ceramic items for decorative purposes tend to gravitate towards these types of garden hose containers. They are a very stylish way to store your garden hose when it is not in use. Fitting the hose into the decorative pot will be very simple. This pot can hold up to 150-feet of expandable garden hose, so you can feel confident that it is large enough to do the job. The hose will be able to be placed neatly inside of this terracotta container, so you won’t have to feel like you are simply stuffing it inside of something to get it out of sight. Taking the time to neatly wind the hose up before placing it in this terracotta container is highly recommended, as this will help you to avoid kinks and other issues with your hose. 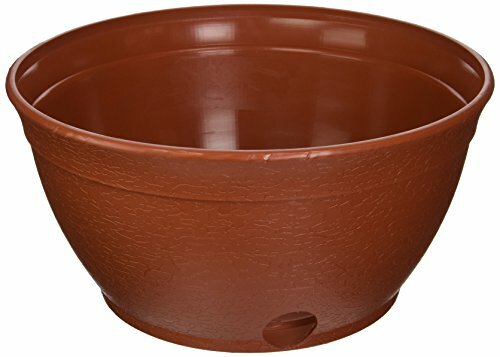 If you have garden areas with containers that look similar to this, then buying this terracotta hose container is very sensible. It will look very natural in your yard and you will be able to make use of it right away. This is another option that doesn’t require any type of installation, as you simply need to place your garden hose inside of the container when you want to store it. It’s convenient and also very affordable. 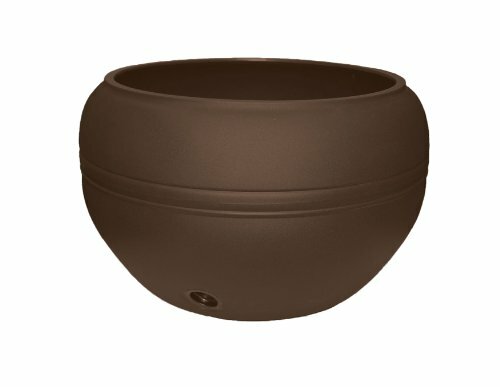 The affordability of this terracotta pot is one of the best reasons to consider purchasing it. Unlike the copper pot, this terracotta container is very cost-effective. You could buy multiple hose containers if you wanted to, and you still wouldn’t be spending too much of your hard-earned money. Saving money is always a good thing, and knowing that you are getting a quality product makes it easy to make the decision to buy this. Buying a metal hose stand might be the most convenient way to store your hose, depending on your situation. The good thing about these metal hose stands is that you can pretty much place them wherever you want to. You can even put a metal hose stand right in the middle of your yard if that is going to be the most convenient thing for your situation. Some models of these metal hose stand simply stake into the ground, and others are free-standing units that are best placed on a flat surface. The metal hose stand that is being shown off here is one of the models that stakes into the ground. All you need to do is step down on the convenient foothold to sink it into the ground. This allows you to easily place this wherever you need it in your yard. It isn’t complicated and it is going to work excellently for your purposes. Your hose can be wound up and stored on the stand very neatly. This metal hose stand is designed to hold hoses that are up to 125-feet long. This is going to be plenty for most people, but if you have a longer hose than this, you should seek out a hose stand that has a greater capacity. As long as you buy a metal hose stand that is the appropriate size for your hose, it will always be simple to wind your hose up neatly and store it at the end of your gardening routine. 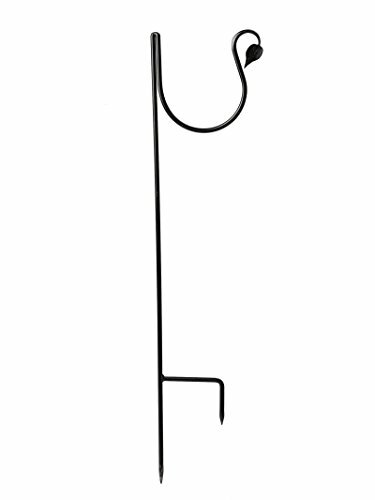 This metal hose stand is resistant to the elements, as well. You won’t have to worry about it rusting or becoming unpleasant to the eyes. The manufacturer uses a powder coat finish on these hose stand to ensure that they are as weather-resistant as possible. This helps you to get many years of use out of these hose stands, so you can buy with confidence. 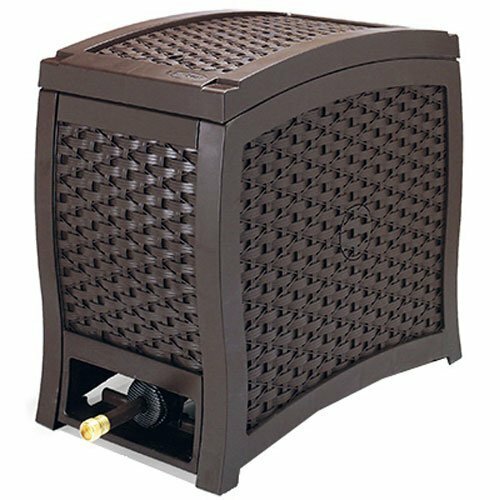 The hose bin is another option that many people turn to when looking for garden hose storage. This is a really easy way to store your garden hose, as you can simply place it inside of this handy bin. One of the biggest reasons that these hose bins have started to become more prevalent is that they don’t look like they house a hose at all. When you’re looking at this item without knowing what it is, it would be easy to think that it is a simple decorative container. It is designed for the specific purpose of housing garden hoses, though. When you buy one of these you can expect to fit your garden hose inside of it very easily. It can readily hold a 100-foot garden hose, so it is up to the task of being a good storage solution. If you have a large yard and require a longer garden hose, then it should be possible to find a bin with an even greater capacity. These hose bins feature holes that you can feed the hose through as well. Unlike the hideaway hose option mentioned earlier, this hose bin does not have a reel. As a result, you will simply be feeding the hose through the hole, and you will need to manually tidy it up before placing it back in the bin. This may not be the easiest way, but most people don’t mind having to do this. As long as you make sure that this bin is well-suited to your purposes, this is going to be a great purchase. It looks really nice and functions well. This will easily be able to sit on your porch and look like it belongs. It is a visually pleasing option that is going to help you store your garden hose without having to worry about things looking messy. Mobile cart hose reels have become more prevalent over the last several years. These hose reels are really useful because you can wheel them around with you. This makes using your hose even more simple because you don’t have to haul the entire length of it around your property. Wheeling this cart around is very easy, so you will have a good time making use of it in your yard. In order to wheel this cart around, you simply need to tilt it back and pull it where you want it to go. It features two wheels on the back, and they work very nicely. It rolls rather smoothly, and you shouldn’t have trouble rolling this cart over your lawn. This is a simple and effective design that you will enjoy using. It has a great storage capacity as well. This mobile cart hose reel can store a 175-foot hose. You will be able to water your lawn or your garden with ease when you have this cart. In most cases, even large yards can be easily watered when you have a hose that is 175-feet long. This cart is made using a durable resin, and it will not be prone to rust. It will stand up to the elements so that you can make use of it for many years. This is a very cost-effective purchase, too, as you can get this product at a very reasonable price. If you want to have a hose storage solution that also offers you mobility, then this is the product that you should be buying. A hose butler is a very convenient storage option to have around. No one likes it when his or her garden hose gets a kink and doesn’t work like it is supposed to. In order to prevent this from happening, you need to make sure that you are storing your hose properly. Putting it away neatly after you have used it is going to provide you with the best results. The hose butler is going to make it exceedingly easy to store your hose neatly. If you mount one of these on your house, garage, or barn, then you will be able to store your hose on it efficiently. It comes with mounting hardware that is simple to use, so it won’t be too tough to get it installed. Once you have it ready, you can rely on this hose butler to store a hose that is up to 150-feet long. This storage option also looks quite nice. It has a decorative design that looks very elegant overall. If you want to put something in your yard that is going to add to the visual appeal of the area, then this is a good option to consider. It isn’t expensive either, so you will be able to purchase this very easily. The difference between this and a typical hose holder is the decorative aspect of it, as well as the size. This is a bit larger than most hose holders, and it doesn’t feature a reel of any kind. It is simplistic, and you will have no problem putting it to good use. If you have your heart set on having metal hose storage but do not have a huge budget to be able to afford one that is made of brass or stainless steel, then it may be time to consider buying hose storage that is made of aluminum. Aluminum is, unfortunately, not quite as durable as other metal options that are available on the market but will withstand weather problems and wild temperatures significantly better than one made of plastic will. Many people love brightly-colored aluminum and think that it adds an attractive appeal to their hose storage, which is why this material is so popular. For a unique look that is sure to set your hose storage option apart from others on the market, choose one that is made of brass. If you have other brass elements at your home, then this hose storage is sure to fit right in and add yet another accent piece to your yard. While brass is fairly durable and sturdy, it does not have the strength and durability that other materials such as stainless steel do. For this reason, it is important to make sure that you put your brass hose storage in a safe location where it is unlikely to become damaged. Expect to pay a little bit more for hose storage made out of this material because of its beauty and how long it will last. If you want to be completely sure that your hose storage will not become damaged easily, then it’s important to opt for one that is made of stainless steel. While it is very likely that you will have to pay a little bit more for hose storage that is made from a durable material, you will benefit from this decision for years to come as even extreme winds and tree limbs falling on your hose storage will be very unlikely to cause major damage. Because stainless steel is so durable, it is often heavier than other types of hose storage, which is something to consider when you are looking for wall-mounted hose storage. You will want to make sure that you anchor the hose storage correctly and securely into the side of your home so that you do not cause any structural problems by attaching this item to your house. While plastic is incredibly lightweight, which makes it very easy to move your hose storage around with you while you are working in the yard, the main problem that you will run into when you choose a storage option made of this material is that is not nearly as durable as other storage options on the market. This is a problem as harsh UV rays, extreme temperature swings, and falling debris from trees can easily damage your plastic hose storage if you’re not careful. Make sure if you do choose hose storage made of plastic that it is durable and that you store in a location where it is unlikely to be damaged as this will help to increase the lifespan of your storage option so that you do not have to go to the store and buy it. One benefit of choosing plastic as the material for your hose storage is that you can generally find storage options in a variety of different colors and this allows you to pick one that will blend in with your home and gardens so that it does not stick out. The resin is a great choice when considering what material for your hose storage is your best option as it is incredibly lightweight just as plastic is but much more durable. While resin is not as strong and reliable as stainless steel is, this is still a much better option if you are on a budget and looking for hose storage that will not fail you. Because resin has been rated up to higher and lower temperatures and can withstand damage from the sun without bleaching or cracking, it is a great choice if you do not have a shady area in your yard where you can store your hose. Additionally, when you opt for a hose reel that is made of resin, you will find that you can more easily move your hose around with you in the yard due to the lighter weight of this material. Unlike some of the heavier metals, which can make it difficult to take your hose with you when you’re working, the resin is the perfect mix of durable and lightweight. You won’t have to worry about whether or not your hose will fit in your new hose storage when you buy storage that has an included hose. This is a great way to make sure that you don’t buy the wrong kind of storage and that your hose and storage will work well together. Everyone knows that it’s terribly important to roll up your hose when you’re finished using it so that it can be stored out of the way and remain in great condition until you need it again. Unfortunately, it can be very difficult for the elderly, younger children, or simply people who do not have a lot of upper body strength to roll up their hoses when they’re done with the watering. This can cause people to feel inclined to leave their hoses laying out across the property. By opting for a hose reel that has an automatic return feature, there is no longer any excuse for leaving your hose stretched out across the grass. Once you have finished watering and using your hose, then you can rely on water pressure or an internal spring to help roll up your hose so that you do not have to labor over doing this work on your own. It can be incredibly difficult to roll your hose up evenly without it piling up on one side of the hose reel or kinking if you do not have a hose guide. Opting for hose storage that has a hose guide included makes it significantly easier to wind up your hose when you’re finished using it and have it stored neatly and evenly so you do not have to worry about any damage occurring to the hose. Some hose guides are automatic while others can be controlled by the person rolling up the hose, which makes it incredibly simple to ensure that the hose is evenly stacked on the reel. This not only makes sure that your hose looks the best when it is in storage but also prevents your hose reel from becoming too heavy on one side and toppling over when you want to move your hose to a new location in your yard. While some homeowners see hose storage as a necessary evil that they have to have in their yards, other people find that this is a great way to express themselves and ensure that all of the features on their properties are as attractive and charming as possible. If you are more interested in improving the appearance of your property than simply buying a hose storage option that will work, then look for one that combines aesthetic appeal and functionality as these are very attractive and even come in decorative styles. Depending on the style and the decor of your home, you may be able to find hose storage that features a favorite animal, flowers, and plants, or simply twists and curls that are appealing to everyone. It’s important when shopping for decorative hose storage option that it is still functional; otherwise, you will have to spend more money in the future to replace it with one that actually works. To get set up very quickly and be able to use your hose without many problems, then you will want to look for hose storage that has a leader hose that is included. This small bit of hose actually connects the hose reel to the spigot in your house and allows water to flow through it. You then need to attach your hose to the hose reel to finish the connection and be able to direct water to where you want it to go. While not all hose storage has to have a guide hose, if you want to be able to roll your hose up on a hose reel and drag it with you, then it’s a good idea to have a smaller piece of hose that connects the storage to the house. This also makes incredibly easy to detach your storage in your main hose from the spigot without having to struggle with this task. Adding a touch of vintage appeal to your yard and your property is very easy when you buy the right hose storage. While you can easily go to a big box store and shop online for new hose storage, if you love all things vintage, then you may want to take your time when shopping for storage as you can easily find a storage option that will appeal to you. Not everyone appreciates the aesthetics of vintage items but as long as you make sure that your new vintage hose storage is in great condition and works the way it should, then you will not have to worry about it failing you. Check to make sure that there are no cracks or other damage in the hose storage itself and do not be afraid to test it to make sure that it can hold the weight of your hose. Keeping your hose out of the harsh UV rays of the sun will help to extend its life, no matter how high-quality your hose was when you bought it. People who do not have overhangs at their homes or sheds in which they can store their hoses to keep them protected from the sun will benefit from buying hose storage that is covered as this will help to extend the life of the hose and prevent cracks from occurring along its length. Another benefit of buying covered hose storage is that it will prevent animals from nesting in your hose during the fall and winter when you’re not it using on a regular basis and will also decrease the chance of having standing water in your storage. Standing water not only attracts wild animals but it also gives them a great place to breed, which can be frustrating for your family to have to deal with on a regular basis. Many people love the minimalist style and there is no reason why they should not be able to enjoy hose storage that meets this aesthetic. Rather than opting for storage that is large and bulky, when you choose something that is minimalist, it is much easier for you and for your visitors to ignore your hose storage. Minimalist storage will seem to disappear into the background of your property and allow the beauty of your home and your gardens to shine through instead of being a large, bulky item that can be a bit of an eyesore. Because minimalist hose storage will have fewer parts, it is important to make sure that you buy from a trusted dealer so that you can rest easy that your hose storage will be high-quality and will not fail you.